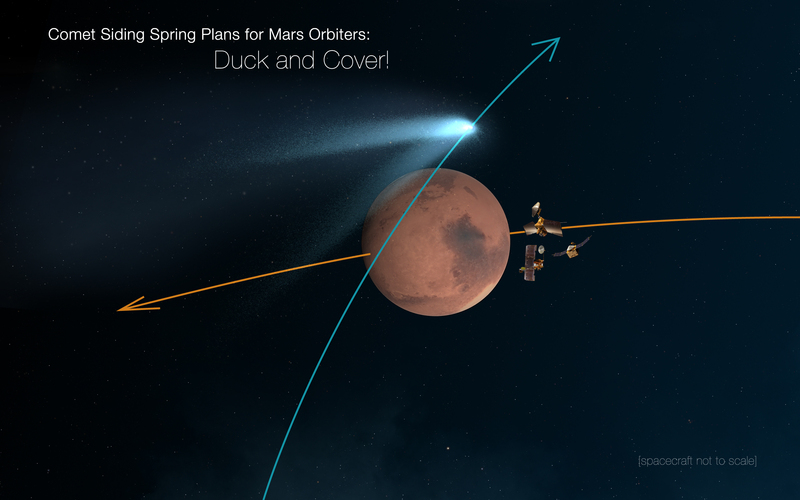 At 126,000 mph, Comet Siding Spring whizzed past Mars. Its core of ice and dust barely missed the Red Planet. Siding spring is the cosmic leftover of the planet-building process, veered 16 times closer to Mars than any comet has come to Earth in recorded history. Scientists had thought that the comet might actually smash into Mars. Instead, it cleared the planet by roughly 84,000 miles. Confirmation of the close approach, at 2:27 p.m. ET, came from the Twitter feed of the European Space Agency’s operations team, which is monitoring the health of its Mars Express spacecraft at the Red Planet. “And that, Ladies & Gentlemen, is history! The closest (non-impacting…) planetary approach by a comet in our recorded history!” tweeted comet expert Karl Battams of the Naval Research Laboratory. In the past, comets have certainly brushed past Mars, but never before have human beings had the means to scrutinize such an encounter. All five spacecraft orbiting Mars, three of NASA, one to Europe and one to India, recorded the comet’s dash. So did NASA’s two Mars rovers and a Who’s Who of other observatories, including the Hubble Space Telescope. Data from the comet’s close approach should become available Monday or Tuesday, NASA said. “Mars Express is working fine!” the European Space Agency said via Twitter shortly after the close approach. “You can’t even think about sending a spacecraft to the Oort Cloud,” planetary scientist Roger Yelle of the University of Arizona said before the close approach. “Here we’ve solved the problem, or the problem got solved for us, because the comet is coming to the spacecraft.” NASA’s fleet of Mars-orbiting satellites and robots on the planet’s surface were primed for the flyby of the comet, hoping to photograph the rare event. It will probably take scientists several months to start interpreting the data collected during this flyby. In a press event last week, officials said the public can expect to see the first comet pictures from the Mars orbiters and probes on Monday or Tuesday.